From now on, the Liveticker is exclusively continued on the page of Moving Europe. 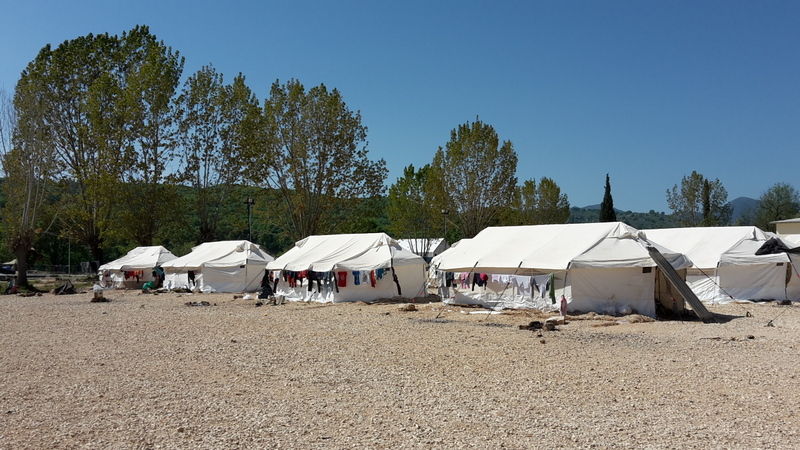 Lagkadikia camp was opened in Northern Greece in the end of April, making it one of the most recent ad hoc refugee camps installed in Greece. 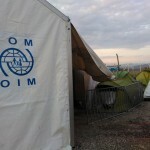 The camp is run jointly by the Greek Ministry of Migration and UNHCR. It is located on a former military site near the small rural village of Lagkadikia. According to UNHCR, over 700 people are already staying within the enfenced area. „Full dignity“ for the people convinced to move to the camp, or false promises? The majority of the people who are now in Lagkadikia were formerly staying in the self-organised camps in Idomeni and Eko gas station. UNHCR employees approached many people in Idomeni and promised that Lagkadikia will be a significantly better place for them to stay. 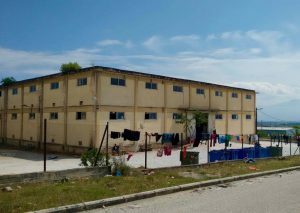 According to the people who moved to Lagkadikia, among the multiple promises were access to family reunification, relocation and the Greek asylum service within 2 weeks, as well as improved living conditions. One family who moved to Lagkadikia told Moving Europe that a UNHCR translator convinced them to go to this camp by saying: “You will regret it if you do not take this chance, you will be very grateful once you reach Germany.” Simultaneously, the UNHCR produced a promotional video advertising Lagkadikia camp, describing it as giving „full dignity“ to the people who came from Idomeni (for full video, see bottom of the page). However, the reality of Lagkadikia camp does not match the expectations raised. Moving Europe discussed the situation with several families in Lagkadikia, who described how the promises were broken and how disappointed they are. 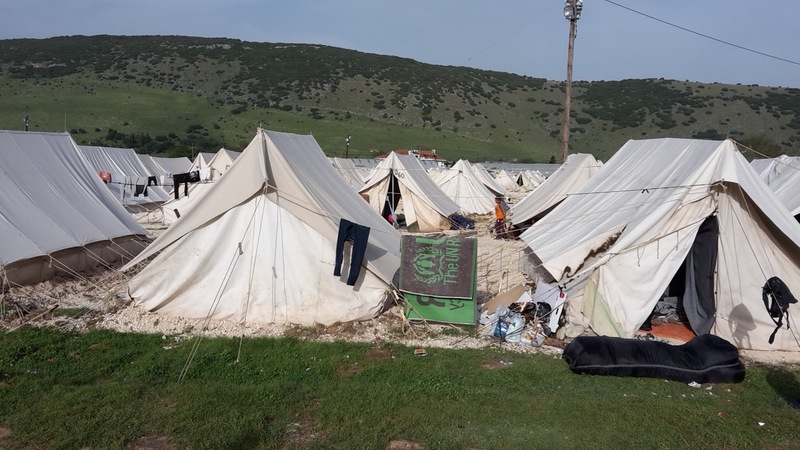 The comparison is based on the testimony of approximately 20 people from Aleppo and Damascus, who came to Lagkadikia between one or two weeks ago due to the promises made by the authorities. Generally speaking, many people were very angry and some people insisted that they will call the UNHCR „only liars“ in the future. The people described that when they approach the authorities in Lagkadikia to ask about the promised legal advice and registration procedures, the answer is that there is no capacity. The majority of the people who spoke to Moving Europe have family in Germany, but little or no information on how to reunite with their closest relatives. 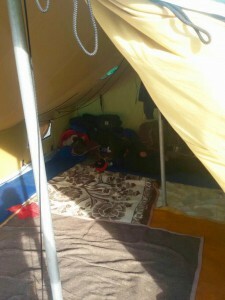 Instead of the promised better living conditions, people are struggling with numerous difficulties: „I cannot sleep at night because the baby of the family on the other half of the tent is crying“, M. described. A man who participated in the violently repressed protests in Idomeni in April and who was injured, described the lack of adequate medical assistance. A family whose member died from a stroke was promised a proper funeral, and told that they would get support in Lagkadikia camp, but according to them so far nobody was intersted in helping them. 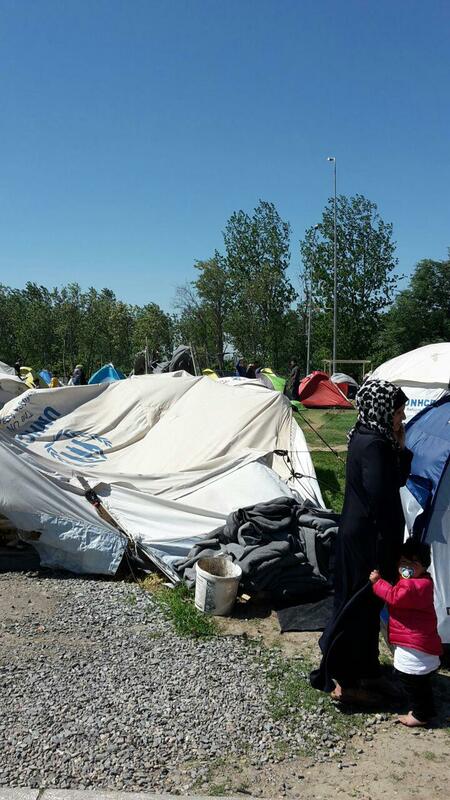 Many people insisted that this camp is worse than Idomeni. R. from Syria stated: „Some people are already going back to Idomeni, and we are also thinking about going back to Idomeni very soon.“ L. explained one of the reasons why she wants to leave this camp: „At least in Idomeni there were many NGOs providing food, there was a bit of a choice, but this is not possible here.“ However, the uncertainty about the future is a more pressing concern than the living conditions during transit. „I fled Syria for my children to have a future. Now my son is learning how to beg instead of going to school.“, B. lamented. Since the 22nd of April 2016 Hotel Plaza in Athens is occupied. On that day, activists and refugees joined action to squat an abandoned hotel in the northern center of Athens. The goal: To creat accomondation for refugees in dignity and run the hotel collectively. In this hotel it’s possible what the Greek state and the charity organisations have failed upon: Accomondation for hundreds of refugees, regardless of their status or nationality. The occupants of “Hotel Plaza”, as well as its new inhabitants, believe in a solution that is achieved collectively. So far, the hotel has kept on going well. All rooms have been cleaned and people have moved in. The kitchen is in use, and part of the dining hall has been turned into a children’s area, and detailed shift plans wait for people to sign in, be it security, cooking or cleaning. Still, daily assemblies are being held. Apart form finances and room issues, also the political strategies to argue for the maintenance of the hotel play a role. Hotel City Plaza provides a safe and dignified accomondation to almost 400 refugees. It is hard to see so many more people coming to the hotel and asking for a room and seeking shelter. But the hotel is already full. To maintain the Hotel, you can support the struggle in donating for food, electricity, medication, cleaning devices and detergents. Verein zur Förderung antirassistischer Arbeit in Sachsen-Anhalt n.e.V. According to UNHCR, there are more than 50.000 refugees in Greece, and almost 10.000 of them continue to be stuck under inacceptable conditions in Idomeni, having one option after the other denied to them. The Skype system for asylum, family reunification and relocation continues to be dysfunctional. Moving Europe discussed the difficulties with L., who has tried the Skype for months and now given up, like many others. „There is no hope in the Skype„, L. elaborated. Because there are no legal options, people in Idomeni have no choice but to try to leave on irregular routes. 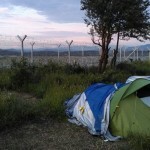 However, many of those who try to walk across Macedonia are systematically pushed back to Greece by Macedonian military. Every day, groups of refugees leave Idomeni with small backpacks and start walking towards Macedonia. Some might make it across to Serbia, but many will be back in Idomeni the next day. „I saw some people leave yesterday night, now I just saw some of them back in the camp„, M. explained. He arrived in Idomeni a few days after the closure of the Balkanroute and has not been able to leave since then. 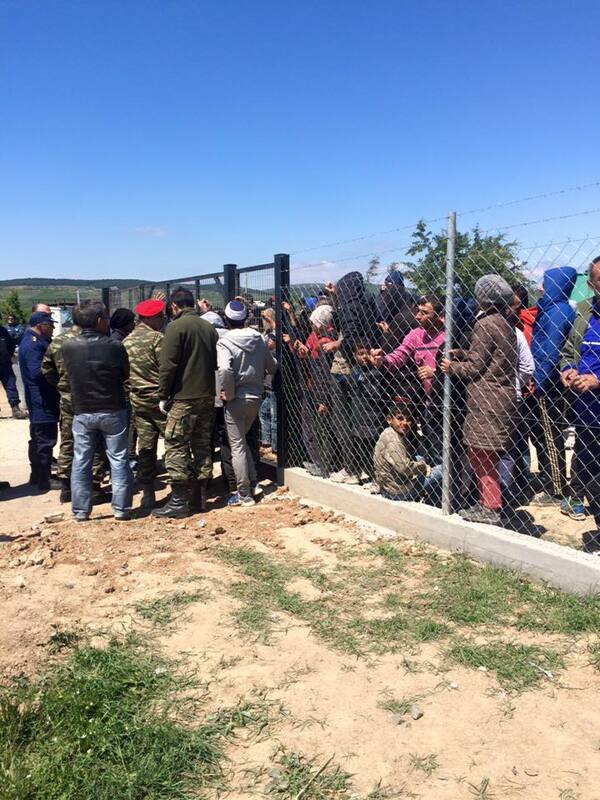 Others do not even have the financial or physical capacity to try to cross Macedonia by foot. The mountainous terrain and unknown territory is especially difficult for people who are less physically mobile, or for small children. Many people cannot leave, but they also cannot go back. G. and W. are in Idomeni with one of their children, separated from their other three children who already arrived in Germany. W. described how they have left everything behind in Syria, how there is no house to go back to. „I was driving my car and somebody from ISIS told me to get out, told me that now the car belongs to ISIS. We are fleeing and we are afraid, also here in Idomeni„, she continued. The camp conditions are intolerable. „There is war in Syria, but this here in Idomeni is also some kind of war„, R. said. „My two sons were killed in Syria by Assad’s forces. Now I am destroying my daughter’s life by sitting and waiting in Idomeni„, she continued. The family arrived in Greece a few days after the closure of the Greek-Macedonian border. They crossed to Macedonia once, in March, but were pushed back together with everybody else. The authorities are increasing their efforts to convince people to leave the Idomeni camp and to go to the official camps instead. 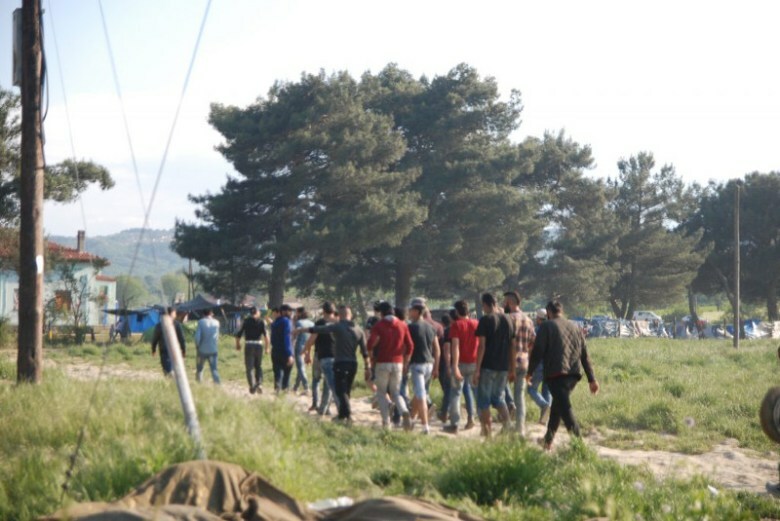 Greek migration authorities visited Idomeni to negotiate and to explain about the alleged advantaged of the other camps. However, „we told them to go away, because we do not believe them, we do not want what they propose and go from one camp to another“, M. explained. Big buses wait at the entrance of Idomeni to drive people away, but many of them leave almost empty. 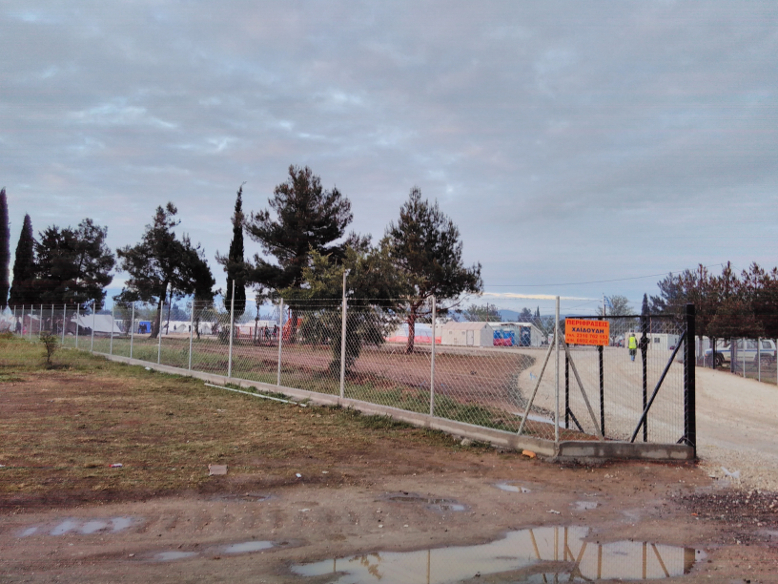 In addition to the negotiations, food supplies were not allowed from coming in to Idomeni, individuals in the camp who set up their own shops were instructed to close them, several journalists were prevented from entering the camp and the police presence in Idomeni is increasing. 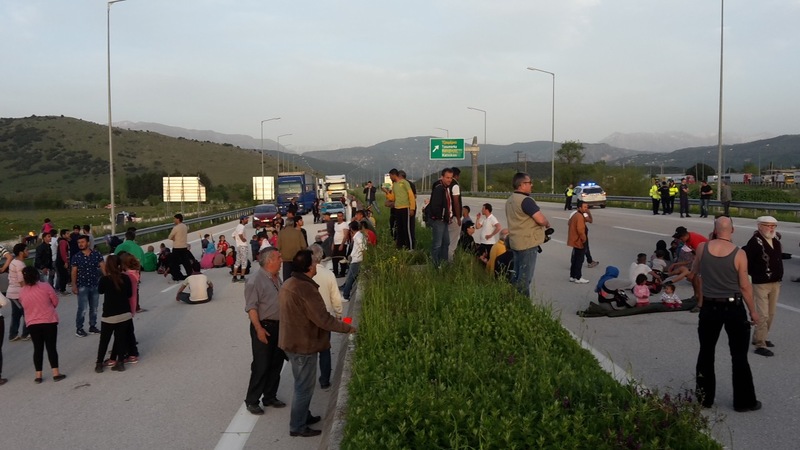 Numerous newspapers reported on the forceful eviction of the occupants of the train tracks close to the Greek-Macedonian border crossing by Greek police on Thursday. Contrary, the situation in most of Idomeni remains largely the same – a situation characterised by the daily struggles of living in tents, makeshift shelters or abandoned trains, by uncertainty, waiting, lack of information and continued attempts to move on despite the closed borders. Discussions revolve around alternative routes and the next political deal or decision, which will impact on the lives of thousands of refugees. Moving Europe continues to receive testimonies of push-backs from Macedonia to Grecce every day, but also news from people who finally arrive in Belgrade. One family was again unlawfully returned to Idomeni after another long night of walking across Macedonia, while another person managed to cross Macedonia on foot. Moving Europe discussed the situation in Idomeni with M., who grew up in a city close to Damascus and has been stuck in Idomeni for several months. What do you think about the current situation in Idomeni? The situation is very difficult. I cannot go back to Syria, and I cannot continue the journey. The weather here is sometimes too cold, sometimes too hot. Many people here are sick, but cannot get proper treatment, because the official organisations do not have enough resources. I also have a medical problem. And after so many weeks in Idomeni, I am running out of money, if I don’t get support, I don’t know, maybe I have to become a thief. All I want is a small place to live and to work. There are so many problems here in Idomeni. What should I do? In Syria death is quick, here death is slow. Do you have any possibilities to move on? 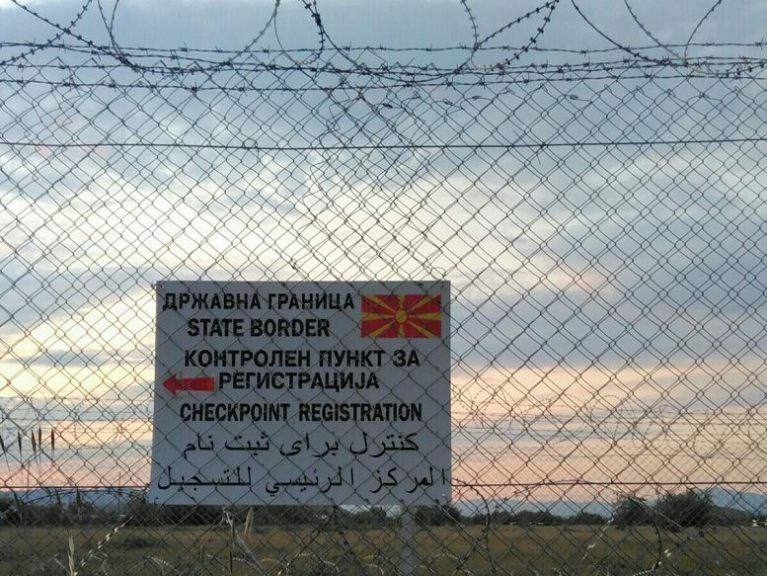 I tried to cross to Macedonia twice. But both times the Macedonian soldiers forced me back to Greece. They did not touch me, because I was carrying a little boy, but I saw how they hit other people. I will try again. Also, every day, I go to the UN office and to the organisations in Idomeni, to ask about the Skype. I want to call and apply to get away from Idomeni. I do not care which country, for me it would be okay to go to any country for relocation. Yesterday we went to the UN office again, they said no Skype. When we asked today they said okay, but in the end it was not possible again, we asked why, and they said now it is finished. Again and again, they say tomorrow, maybe it will be open tomorrow. And they do not fulfil their promises. So we made a protest, we do not want more false promises and we want to know what we can do to change our situation and what will happen to us. What about the official camps run by the Greek military? I went to one of the camps, to Katerini stadium. The officials in Idomeni showed me pictures of the camp, and said that I should go there and that there is hot water and organisations to apply for asylum or relocation. But this was not true. The camp was cold, there were mice, and very little food, just one croissant and one juice for breakfast. I came back to Idomeni the next day. I did not really know where I was, so I had to pay a taxi and it was expensive. 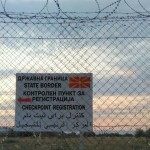 I will try again to cross Macedonia. With many thanks to Mohamed for the translation. Moving Europe: Can you tell us about the situation in Chalkero? We are loosing our hopes day by day. And people get more and more angry. The situation is very difficult. Only very few people reach the asylum service via Skype, the option of relocation seems to be a trap and the conditions of living are bad. We all are running out of money. Moving Europe: Do people have to spend a lot of money? The food is so bad, that most families buy groceries to cook their own food on small fires. We cannot eat the military food anymore. Macaroni pasta for weeks and weeks just makes you sick. That means that a family has to spend around 20 Euro a week for food. Al lot of people have to ask friends and families for money in Syria and ask if they can send money by Western Union to Kavala. But 20 Euro is a small fortune nowadays. Because of the war the inflation skyrocketed. Now you need around 600 Syrian Pounds for 1 Euro. But the average monthly salary is just about 16’000 Syrian pounds. This is now just around 25 Euro. 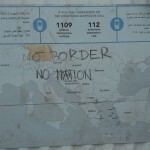 Moving Europe: We reported about protests in Chalkero. Can you tell us more about it? We protested about our situation for weeks now. But on the 29th of April, people had enough and got tired of the promises that were never fulfilled. And the heavy rain and the rotten food accelerated the willingness to protest again and block the road. But the main reason for people stuck here is the psychological pressure. We do not want to be stuck for months and months. So on this day, around 40 people out of the 200 in Chelkero blocked the road. The police officers called their chief and later he came and talked to the people and said it’s a fault doing that and that we are hurting the Greek people. 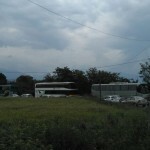 The blockade ended, when he promised to have a meeting to discuss the situation and said that they will do their best. Moving Europe: What are your demands? We want the border to open. But we know that this is a European decision. People want access to the asylum and relocation system. And access to family reunification. But to get an appointment with the asylum service we first have to reach them by Skype. But they have only one account on Skype. So it’s nearly impossible to reach them. For the family reunification I think around 15 families in our camp have the right to go to Germany, because the women have their husbands in Germany or underaged children. So, to be reunited is the right for about 50 people in Chalkero. But nearly nobody can reach the asylum service for reunification. And we want better conditions of living. Our tents get wet when it rains, we want decent food and we want to know what will happen to us. Moving Europe: And do you think they will keep their promises? I do not know. 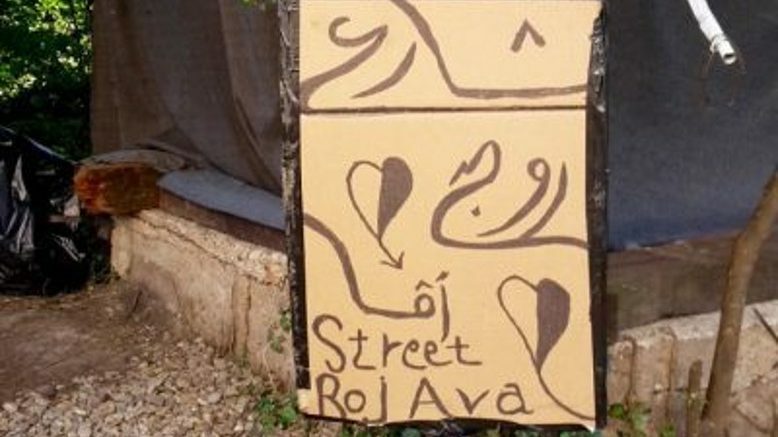 On Wednesday, we had the first of the promised meetings with a police officer, the UNHCR, a person from the municipality and a doctor from Médecins du Monde who is working in our camp. 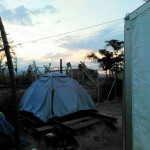 They promised to improve the conditions of the camp. We asked them to bring caravans or containers for us to live in. 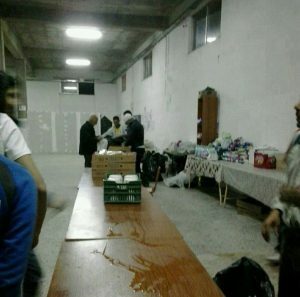 But for example they still do not allow volunteers to bring to us donated food. The families need pampers for their small children and baby milk. I do not know if the conditions will get better for us. Yesterday a high representative from the church came to the camp. He was kissed on his hands by the police officers. So he must be important. They brought donated children clothes and took pictures. If they will do something about our situation I do not know. Moving Europe: Do you have any plans for the future if the situation does not get better? We are in contact with people in other military camps. Some are thinking of doing a protest on the same day so people do not forget about us. There are four camps in the province of Pieria. Petra Olympou is the biggest camp, managed by the Hellenic Army. According to UNHCR, almost 1’000 people have to stay in this place. As many other camps, the site is secluded in the mountains, at least half an hour away from the next biggest town. The site was formerly used for a psychiatric clinic. There are three buildings, but instead of being accommodated in one of the buildings, all refugees are housed in tents on gravel ground. 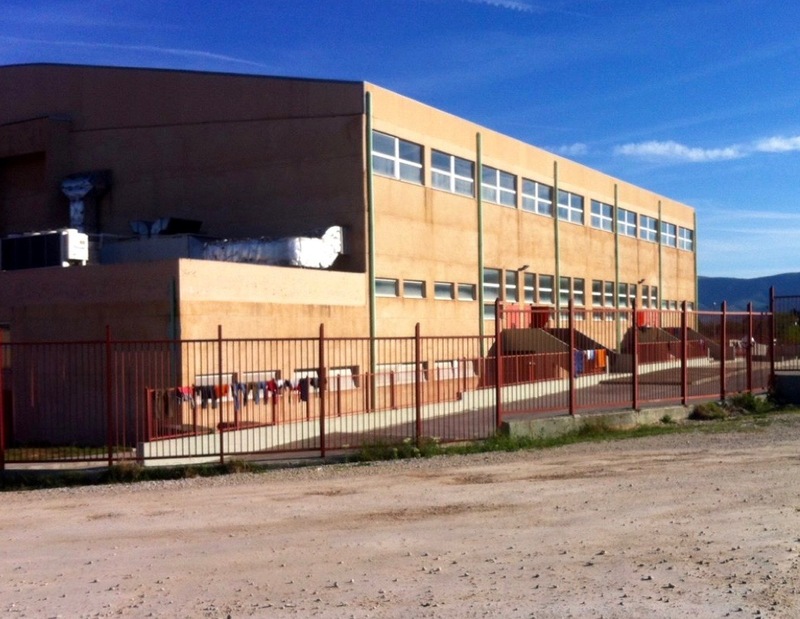 The site administration told Moving Europe that one of the houses is occupied by military personnel, while the second one is being used for medical services and other activities, and the third continues to be empty. Given the location in the mountains, the temperature drops considerable during the night. 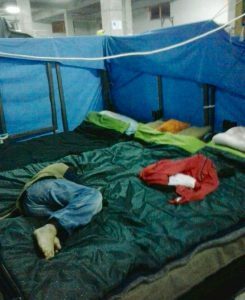 Refugees have to stay in tents. Giannitsa camp was opened on 21 March 2016. 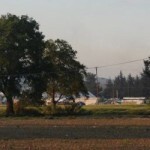 The camp is located in an industrial estate along the highway between Edessa and Thessaloniki, three kilometres away from the city centre of Giannitsa and apparently without any bus connections. 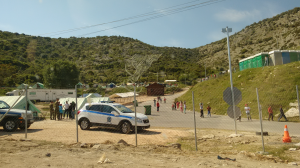 Giannitsa camp is managed by the Hellenic Army and entry controlled by the Hellenic Police, who usually refuse to let individuals enter the fenced area without registration. 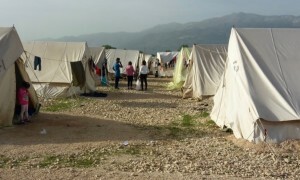 We were told that the UNHCR and a few international and local supporters regularly visit the camp. 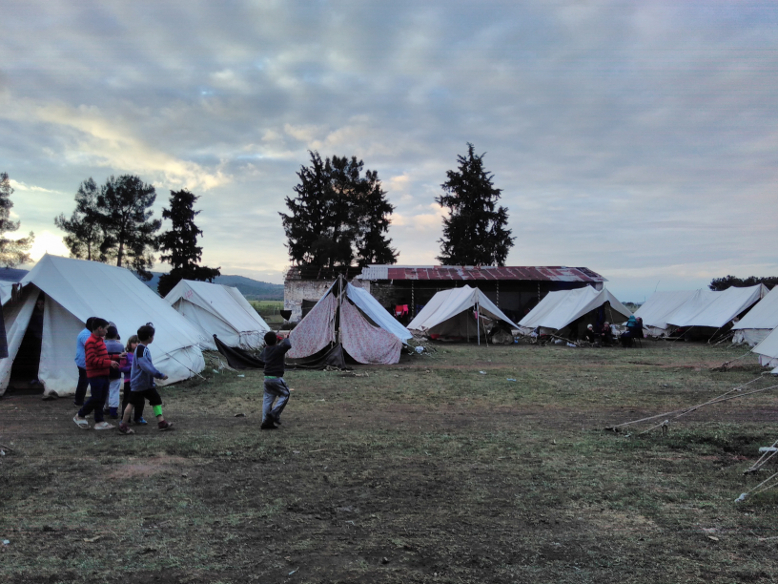 In Giannitsa, around 800 people are accommodated in only 127 tents, with up to 8 people in single tents and up to 15 people in double tents. The tents do not offer adequate protection from the rain, storms and hot sun. “We are completely exposed to the weather here because we only can stay in the tents”, S. said. Meals are provided three times a day and as there is no common space, people usually eat inside their tents. A., from Syria, emphasized: “I know that they pay a lot of money to the catering enterprise for this little amount of food we get. It would make more sense to get the money for ourselves and cook what we like.” She added, that the food is insufficient for the children and therefore parents have to buy basic supplies in the supermarket several kilometres away. According to many people, the sanitary facilities are equally insufficient. There are only 28 toilets for everybody and there is still no hot water for showering. „My children always cry when I wash them with cold water“, K. explained. At the moment people can still only apply for asylum, family reunification or relocation if they reach the authorities by Skype. But accessing the Skype service is nearly impossible. 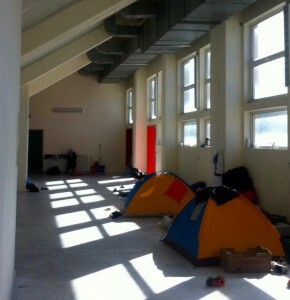 There is no wifi provided by the camp administration, so people have to try to connect to the internet via private mobile connections. 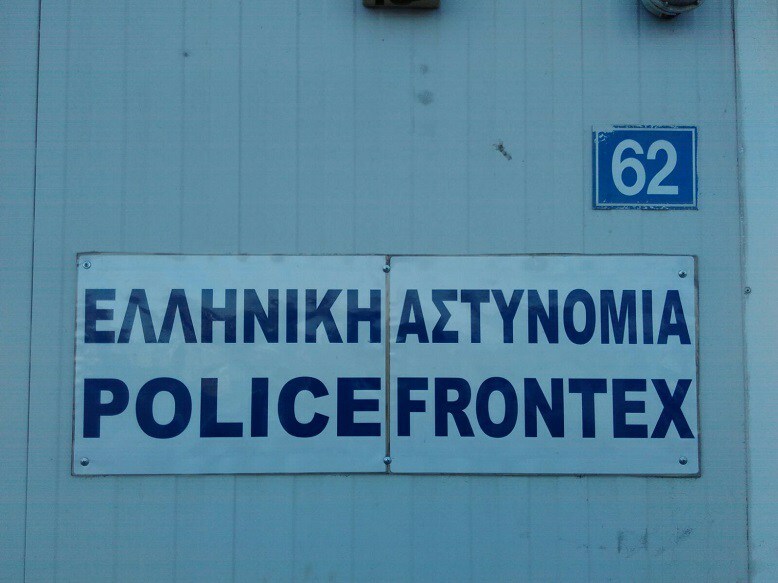 But having a stable internet connection does not mean reaching the Greek Asylum Service: „Nobody here got through on Skype trying to reach the Greek Asylum Service“, M. said. Regarding relocation, some people have reached the relocation service, but the subsequent process is lengthy and likely only to work for a small proportion of people. 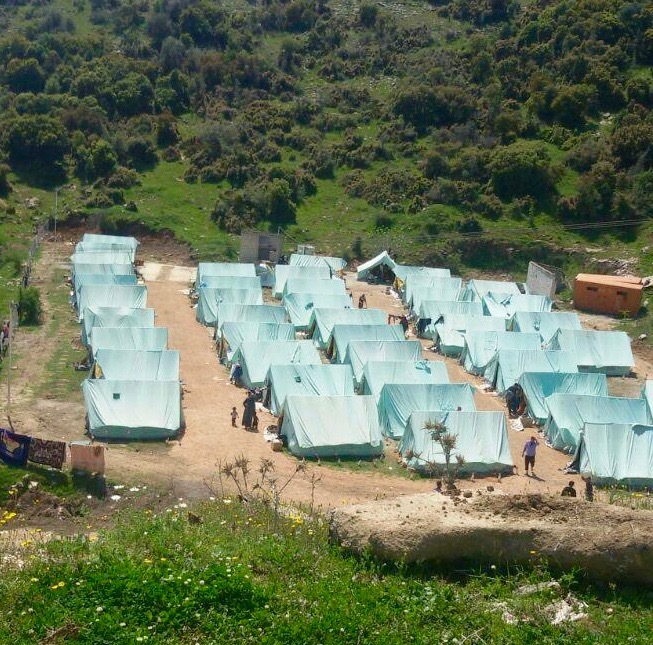 The camp in Alexandria opened on 14 April 2016. According to the UNHCR, around 700 people currently stay in Alexandreia, the large majority coming from Syria. The camp is managed by the Hellenic army, and is a formerly military site surrounded by big stone walls and barbed wire fence. The buildings in the camp look like old dilapidated military barracks, but they are out of use. Nobody is accommodated in buildings, all refugees in the camp sleep in one of the 140 tents standing on asphalted ground. No psychosocial services are available. 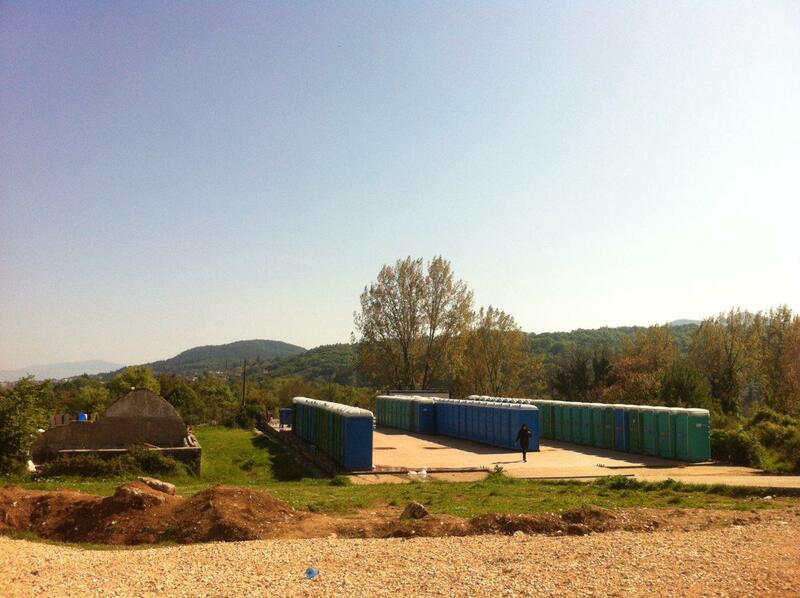 The camp has only 32 toilets, implying that more than 20 people share one toilet. The toilets are dirty and cleaned only once a day. The people repeatedly tried to talk to the authorities about the toilets. But, as R. explained to Moving Europe, „this police man over there, he talked to us like animals“ – and the toilets continue to be dirty. 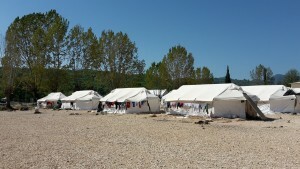 The public washing facility with cold water is outside in the middle of the camp. 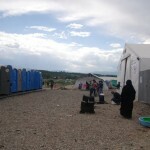 R., a woman from Syria, told us that she tries to wash herself and her son inside the tents. 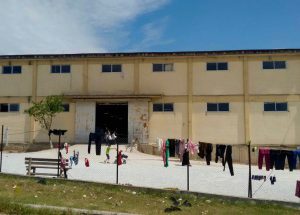 After numerous complaints, the authorities promised to install proper showers in one of the unused hangars, but nothing has happened so far, and it is unclear how the dilapidated building can quickly be transformed into a functioning washing facility. „The Greek government does not have anything to give to us“, and the resources of the UNHCR are equally insufficient, R. emphasized. Almost half of the inhabitants of the camp are children, waiting in the camp instead of taking up educational opportunities. Moreover, there are no secure possibilities for children to play, instead there are sharp objects lying around on the gravel and there is a big puddle of dirty water next to the tents. A young boy was bitten by a scorpion and had to be taken to the hospital. The Skype service for applying for family reunification, relocation or asylum raises many hopes but continues to be dysfunctional. Moving Europe discussed the situation with a Syrian family, who arrived on the Greek islands from Turkey in late February, and were told on the bus towards mainland Greece that the restrictions at the Greek-Macedonian border are increasing. After several harsh weeks in Idomeni, they came to Alexandria. After uncountable unsuccessful calls to the asylum and relocation service on Skype, the family got an answer only once. However, the phone call only lasted 1:48 minutes, and they were told to turn on the camera and to call again on Wednesday, without having had their names registered. The camp lies next to the city of Alexandreia, and despite the circumstances there are nice encounters between those who recently arrived and those who have been living in the area for a longer time. A festival is being organized from 3-5 May, with cooking of Syrian and Greek food and children plays. Thanks to Ali Borsan for his permission to reprint the pictures and videos. Moving Europe previously reported on the unsupportable conditions in Cherso camp on 7 April 2016 and 24 April 2016. The situation has not changed, inducing people in the camp to protest against the authorities and conditions in the camp on 26 April 2016. Moving Europe returned to Cherso on 29 April to speak to protestors and the families who continue to be stuck in Cherso. However, the response of representatives of the camp authorities and organisations present in the camp was that they cannot change the situation: The border will not re-open, they cannot say what will happen, and the only option is to continue waiting. In response, the refugees started to demonstrate, and kicked out the authorities managing the camp and the organizations working within it, closing the gates and refusing to let them re-enter the camp. The situation was very tense and people were very angry. 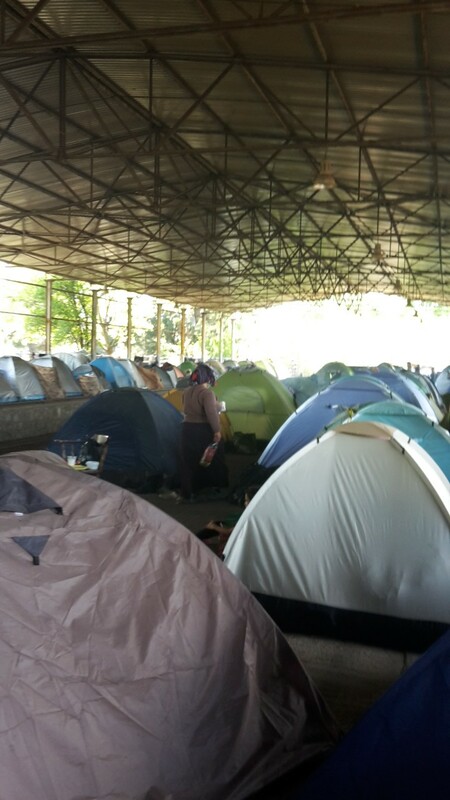 At some point, one of the humanitarian workers in the camp started negotiating with the protesters until they agreed to let the camp authorities and staff return to the camp, to once again demand to improve the conditions in the camp and the possibilities for asylum, family reunification and relocation. However, none of this happened so far – instead the situation remains largely the same and the Skype service continues to be mostly inaccessible. In Cherso, Moving Europe spoke to 8 Syrian women, who have all been stuck in Cherso camp for 2 months, having fled Syria and undertaken a long and difficult journey just to be told that the border is closed. They are unable to pass the Greek-Macedonian border to join their husbands, sisters, brothers and children who are waiting in different parts of Europe. One woman, N., had her baby born in the camp 7 days ago and asked for medicine. Her two other children and her husband are in Germany. Another woman, W., with 5 children is worried about how to unite with her husband and her other 4 children in Germany, while not knowing how to provide for her one child in Cherso in the meantime. The separation, uncertainty, lack of information on future perspectives and waiting under difficult conditions is unacceptable. The conditions in Cherso camp are wholly inadequate. The families and individuals in Cherso repeatedly emphasised that the living conditions are unsupportable, there are snakes, the water is not clean, the food is not good, everybody runs out of money and people feel insecure. 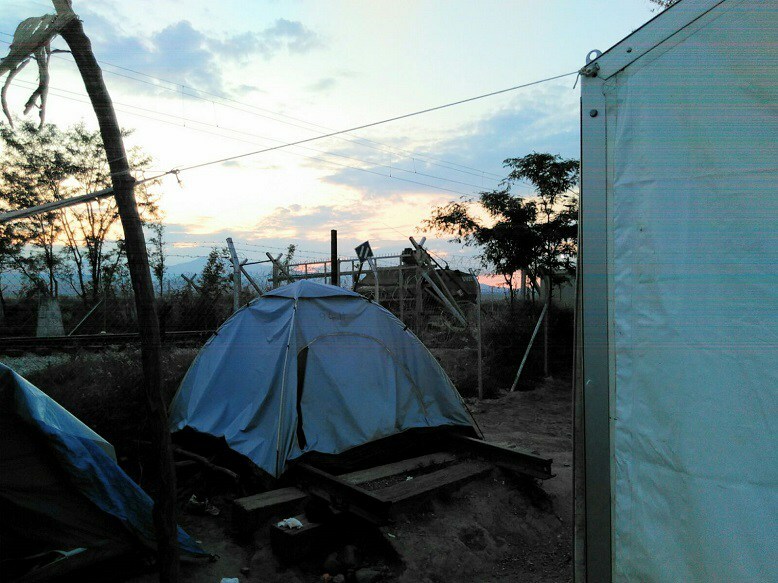 Many people who live in the camp suffer under the inadequate conditions and consequent physical and mental health problems without any adequate treatment available. I., has a two years old boy, who has asthma. They got respiratory equipment, but she does not have electricity in the tent to connect the machine. The people ask for a political decision to change the situation. But instead of answers, there is the waiting and incertitude. The situation in Idomeni has not changed much in the last days: there are still people sleeping in tents and abandoned train compartments, long queues at the food distribution, volunteers collecting garbage, kids running around everywhere and adults trying to organize daily live. The train tracks towards the Greek-Macedonian border crossing are blocked and guarded by two large Greek police vans. The continued closure of the Greek-Macedonian border forces refugees to seek alternative – illegalized and therefore more dangerous – routes. 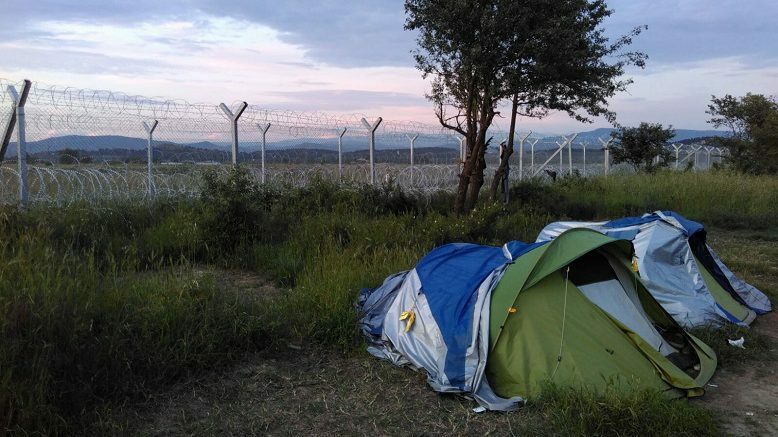 Some people left Idomeni and go to bigger cities, few leave for the state-organised camps, some try to cross into Macedonia/FYROM by walking but are regularly and repeatedly pushed-back to Greece by the Macedonian/FYROM authorities. 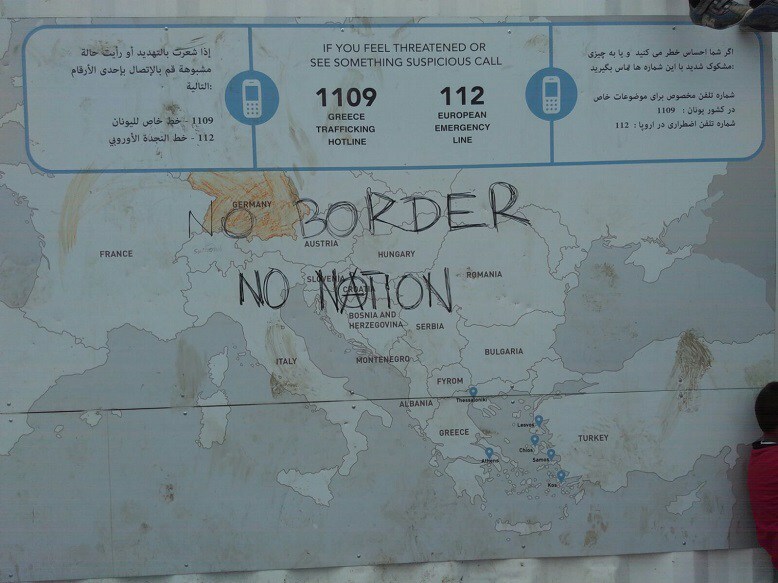 Alternative routes seem to be the main conversation topic in Idomeni. What are the best routes? How dangerous is it? How much does it cost? Where to get enough money? Closing the border does not counteract the smugglers, instead it increases the number of people who depend on them. However, only people with the financial and physical abilities can attempt the difficult illegalized routes. 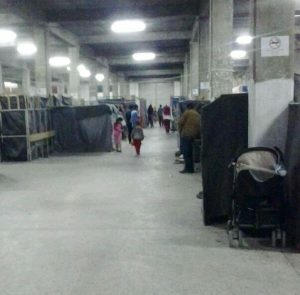 Families or single adults with small children are mostly forced to stay in Greece. 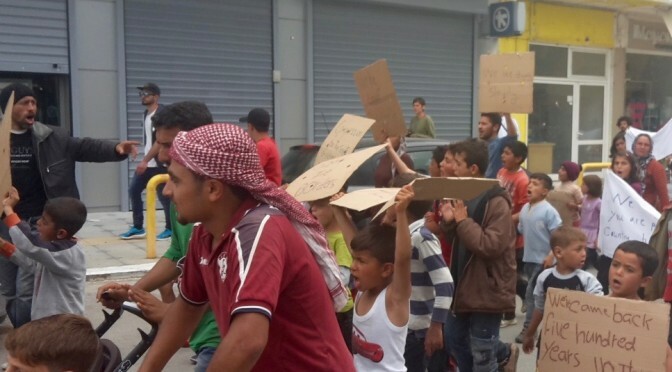 Moreover, on the other side of the borders there are people who want refugees in Idomeni and elsewhere to move on, such as the group Welcome to Wuppertal who are pressuring the city to „Let people from Idomeni come to Wuppertal“. This settlement does not cover any of your basic everyday needs. It will end its operation. 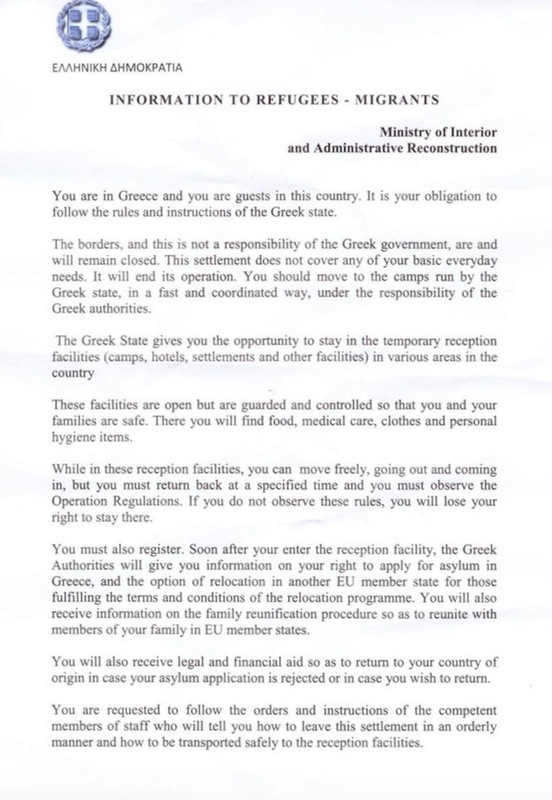 You should move to the camps run by the Greek state, in a fast and coordinated way (…). Soon after your enter the reception facility, the Greek Authorities will give you information on your right to apply for asylum in Greece (…). Speaking to different people in Idomeni, many voiced their disagreement with the content of the flyer. 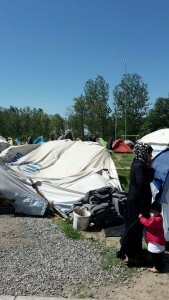 An old Syrian woman explained, that she spent three days in Nea Kavala, one of this state run camps. She felt, that the camp in Idomeni offered better conditions of living: ”Here we have freedom; there it was like a prison“. This is why she returned to Idomeni. He adds, that for many families the situation is deteriorating. Many families run out of money and have literally no satisfactory options left: They can neither apply for asylum nor for the relocation program, as the only option to access these are via Skype which is not working (read here??? 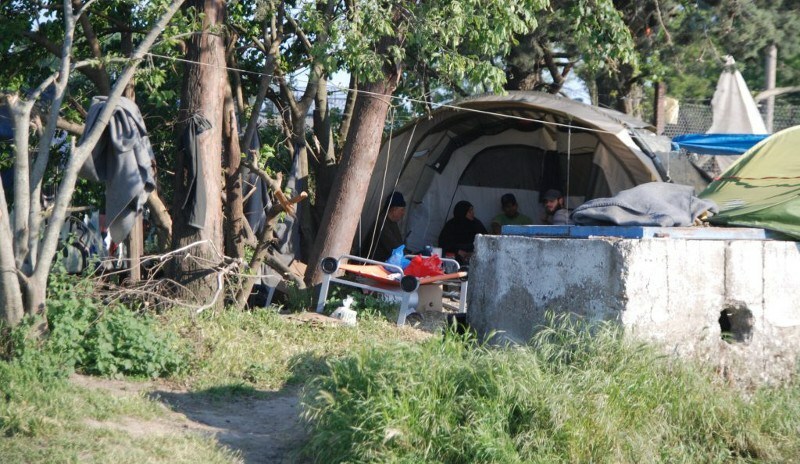 ), moving to an official camp will not improve their living conditions and paying a smuggler is not possible anymore. This is way many people try to walk through Macedonia/FYROM. However, a lot of people get caught and sometimes even robbed and are then illegally pushed back to Greece, ending up back in Idomeni. Nonetheless, every day people on the move manage somehow to travel on to their destinations. But because the borders are closed, there is a lot more costs and suffering involved. 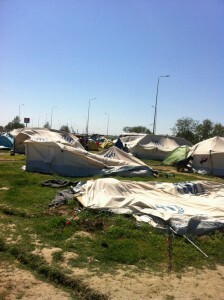 Protest in Polikastro – most vulnerable people are housed in tents without proper mattresses in Cherso. About 500 people are housed in an old factory that once processed wood. The factory has probably been out of business for some years. Bushes are growing on its roof. The next town, Drama, is located about 10 km away. 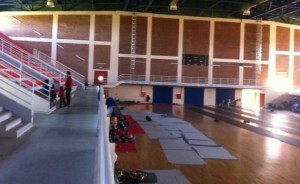 All people live in one big hall. The concrete hall is divided into “rooms” by constructions covered with UNHCR-blankets. As in other camps, the police guard the entrance and do not allow visitors inside. People from the town of Drama regularly bring donations, but apparently are no longer allowed to enter the camp as well. According to a man who is staying at the camp with his family a lot of people have psychological problems and it is getting worse day by day. We are told, that tensions in the camp are rising. Two days ago, a man was badly injured in a fight and was brought to the hospital. People told us that the police just ignored the fight and did not intervene. As in the other camps, there is nobody in the camp that informs the people of their legal rights and options. 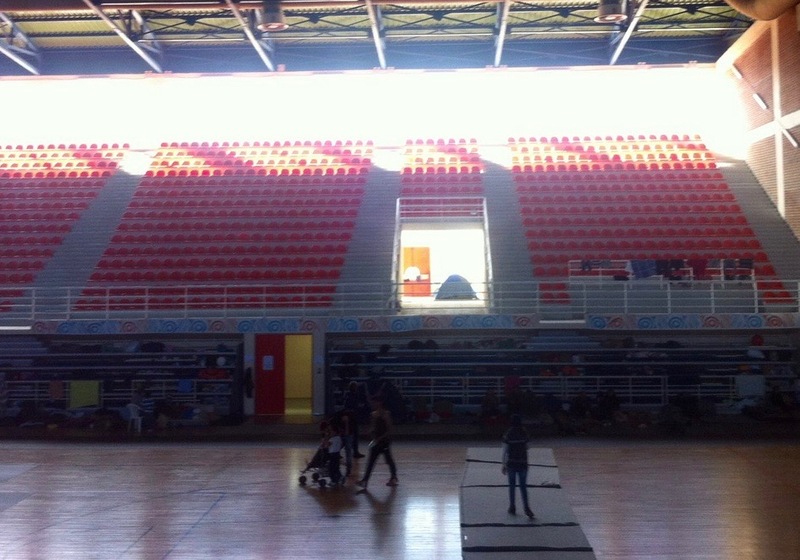 The two women have heard other people trying to get appointments in Alexandroupoli because nobody was able to reach the asylum service via Skype (we reported on the non-functional Skype procedures here). They apparently succeeded and got appointments for August. 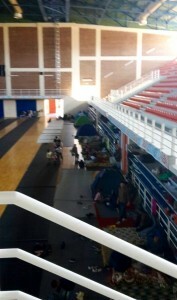 Others are leaving the camp for Athens or to find their own way. It is no surprise that he two women want to leave the camp as well and go to Athens. They hope to find better accommodation and some organizations in Athens that could help them with the process of family reunification and give them information about other options as well. All pictures are taken by people living in this camp. 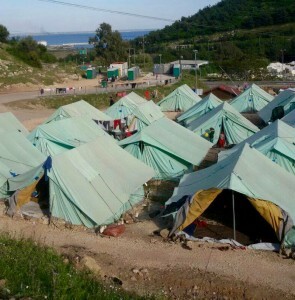 Today we visited a Camp outside Kavala in Eastern Greece. The camp is situated in an old marble mine secluded from any villages. People are staying in tents there, sleeping on the rocky ground. The police is guarding the entrance and does not allow people visiting the camp. As police did not allow us to speak to the people inside the camp, we met up with a Syrian man from the camp in Kavala and asked him about this camp. Moving Europe: Can you tell us how you came to Kavala? In Aleppo I was imprisoned many times because I was active mainly on social media channels against the regime. I believe in rights and freedom and that we can do whatever we dream of. The regime imprisoned me many times because of my political stands. Later came the bombs in Aleppo and radical forces took over Aleppo. And these radicals never accept activities from the civil society like my actions. So I fled to Turkey. At the border my nephew, who is sixteen years old, joined me. His brother was killed in the war by a bomb and the family of my sister wanted him to go with me to find a safe future for him. After the very dangerous crossing of the Aegean Sea we came to Lesvos and finally to the port in Athens. There, they brought us to a camp in Nea Karvali. I think this was a somehow better camp. We stayed in a building, but it was very crowded for the around 700 people. We had for example only one bathroom for men and one for women. That was not enough. At that camp we stayed for more than one month. But every week the police told us that we have to leave this camp very soon. One morning, they came and said you have to leave now. We asked why. They said that the camp will be used as expo grounds again. So they brought 8 buses in the morning and promised us to bring us to a better place. We did not trust them and wanted to know to which place they are bringing us. We were not getting any answers and therefore we refused to enter the buses. But the police reacted by bringing riot police with electric sticks and shields. So we had to board the buses. 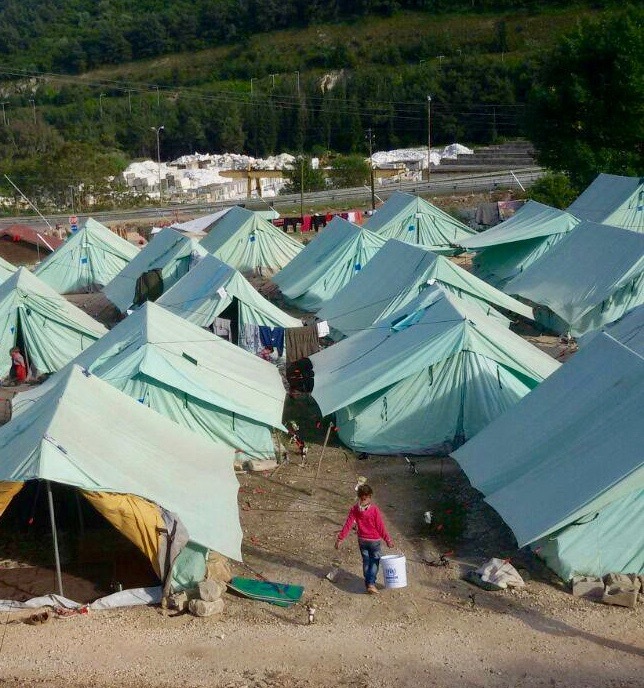 Together with a little less than half the people I was brought to this camp near Kavala. The others left for a camp called Larisa. But they protested and because of their protest they are now in a better camp. 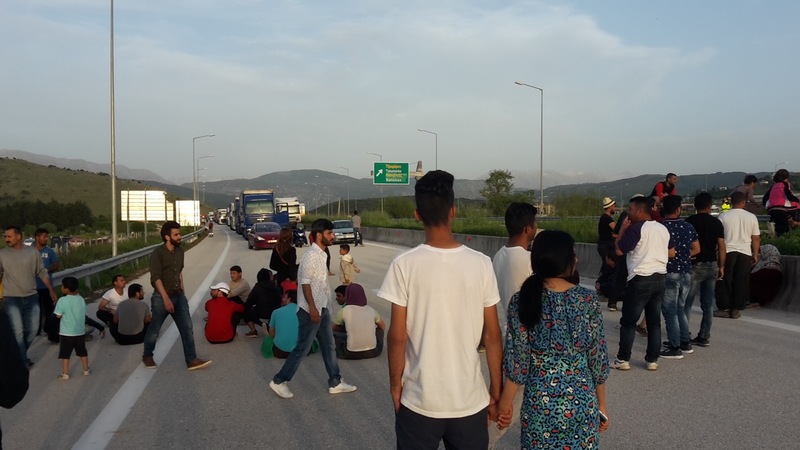 Moving Europe: Can you describe the situation in Kavala for us? The police are not friendly to us. I think that the chief is a racist person. We have to stay in tents on rocky grounds with only a very thin inflatable mattress. We were given one sleeping bag and one blanket each. At nights it is very cold, and during the day it gets very hot. Up to 8 people have to sleep in one tent and we see snakes every day. Not everybody can eat the military food. But we have no facilities to cook for ourselves. Only by fire, but the police always tells us we cannot do that. Sometimes, there are small fights between some people of the camp and the police wants to take them to the police station and people are scared they will be deported to Turkey. But we collectively stop the police from taking people to the police station and then solve the problem among ourselves. I think our situation is getting worse day by day. The best thing in this place is the view. It is very scenic (laughs). Moving Europe: What is your opinion: How is the European Union treating Refugees? For me the EU-Turkey deal is a crime. They are punishing us. But what’s our crime? We don’t know. Europe wants to stop migrants and now we are stuck here, we are disappointed and sad. Some people are even thinking of going back to Turkey. Sometimes we feel like prisoners, we have no hope left. We have no information what will happen to us. We feel that the EU sends a secret message to us: Go back to your country and die there. But the people from the civil society in Greece and also from other countries are really good and kind to us. We are very grateful for that. They are not the same as the government. Moving Europe: How do you cope with that situation? Actually since 3 weeks we cannot make plans anymore. Because we don’t know what choices we have. They tell us that the borders will stay closed and will never reopen again. We just have the option of relocation, smugglers or of going back. We cannot reach the asylum service over Skype. Nobody I know ever reached the office. We are trying to be patient. But making decisions is very difficult at the moment. I need to find a safe place for my nephew. I do not care about myself, but he has the right for a safe future. We are fighting for our rights and keep fighting until we reach a safe place. And only there we will have a rest. People in Idomeni were repairing their tents and constructions for shade today, which the very strong wind tore apart yesterday. However, the people in Diavata had nothing to repair. Their tents with all their belongings inside burned down completely. Moving Europe visited Diavata today and spoke with several people from the camp, while the army was setting up the exact same white UNHCR-tents on the spot. The fire apparently started from a fire lit in order to cook. Due to the strong wind and the fact that the UNHCR-tents are set up very near to each other without sufficient space between them, the fire consumed dozens of tents in just a few minutes. Today, only burnt metal sticks and other burnt belongings such as a totally burnt wheelchair were visible. It was sheer luck that nobody got severely injured yesterday. But many people lost everything: clothes, smartphones with their contacts, passports and all their money. The fire took everything they had. It is hard to understand, why thousands of people on the move are put in to this insufficient shelter in Europe. Other sad news reached us today in Idomeni: The man who was hit by a police car in Idomeni on the 18.04.2016 died due to his injuries today. The wind is unbearably strong today around Idomeni. A lot of tents have been destroyed by the wind, even some of the larger UNHCR tents at Eko Gas station. The living conditions in the tent camps become even harsher in this weather. In Diavata camp close to Thessaloniki a fire spread and around a dozen tents burnt down completely. The people lost the little possessions they had to the fire. At the first glance, having returned to Idomeni after two weeks not much seems to have changed. However, having seen many other camps in the meantime, Idomeni does not look like the worst place anymore. The large number of support structures cannot be found in any other places. 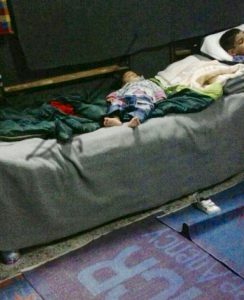 While the living conditions in Idomeni are worse then in some camps, they are better then for example in the camp in Katsikas. Further, the value of having places and people that you can ask for help in case something happens cannot be underestimated. Sleeping in a proper building, but being completely isolated and forgotten in the mountains like in Dolina, is not considered ‘better living conditions’ for some refugees. 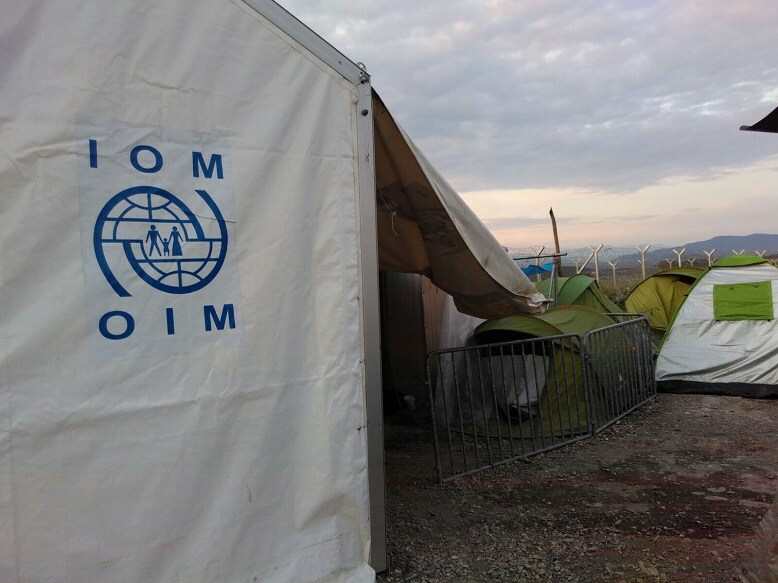 The repeated insisting from officials and media that people should leave Idomeni and go to ‘better’ official camps cannot be taken serious – besides the fact that there are far from enough places in the official camps. According to the UNHCR data, there are only places for 30’860 people in the official camps on the Greek mainland. However, there are 46’450 people stuck on the Greek mainland. Besides our changed perception of Idomeni, certain things did changed. While more infrastructure is steadily being built up by NGOs and volunteers, the needs are also changing due to the changing weather conditions. It is getting hot. Temperature is reaching around 28 degrees Celsius in the afternoon. The small tents that are exposed to the sun get unbearably hot. However, there is not a lot of shade in the vicinity of the camp. Only few trees and houses, as it is on agricultural land. What has further changed is the behaviour of the Greek police. They are checking the cars that enter the camp more regularly and arrested several volunteers last week. 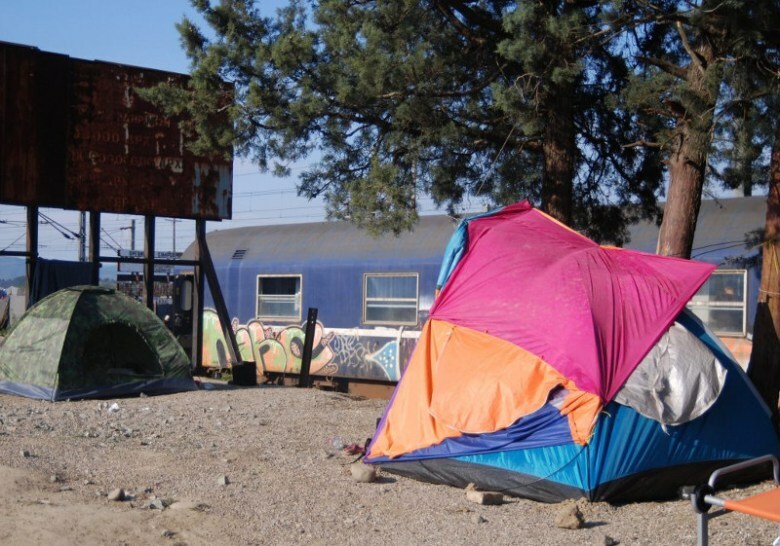 The police evicted the train tracks today, removing the tents that people have set up on the tracks. 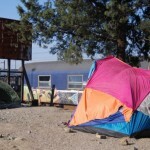 While the eviction was said to be peaceful and successful, people re-occupied the train tracks equally peaceful and successful two hours later. However, in a fatal incident this afternoon, a police van hit a man, leaving him with severe head injuries in critical conditions. The outraged people in the camp thereafter attacked the police van, smashing its front window. The anger of the people stuck in Greece is accumulating, as they feel abandoned and mistreated by the authorities. People camping in the shade in the very south east of the camp. Y. a 16-year old Syrian girl whom we already met in Idomeni explained her situation. She arrived in Greece with her 18-years old sister and her 13 years old brother in February, when the Balkan corridor was still open. Her twin brother has already travelled to Germany earlier and is waiting to reunite there with them. The three siblings went to Idomeni, but only very few people could still pass and eventually the corridor was closed. So they could no longer travel on. After spending two more weeks in miserable conditions in the camp in Idomeni, they decided to try and find better shelter. They went with an official bus to another camp and ended up in Kozani. “The situation here is better than in Idomeni, at least we do not have to sleep outside in the wind and the mud. But we don’t want to stay here. What is going to happen with us here?” Y., who took over the responsibility for her siblings, is trying to find a possible way for them to reach her twin brother in Germany. So far, the people in the camp have not received any information about their legal options from any official side. 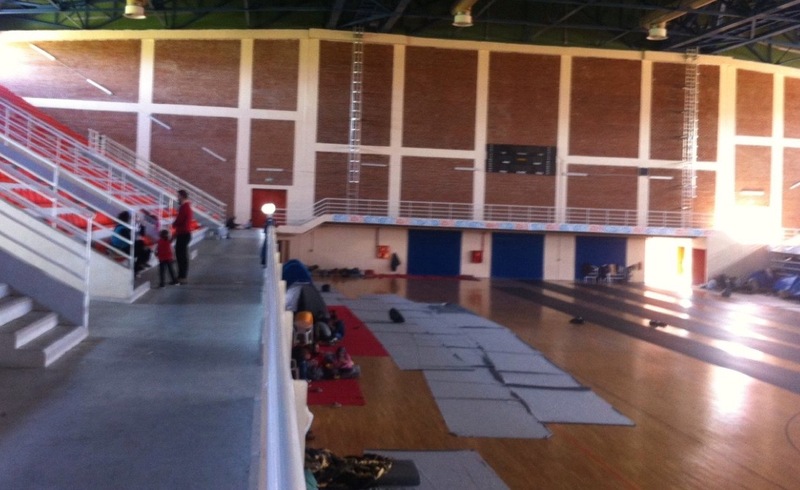 They were told, however, that they will be moved from Kozani soon, as the sport hall needs to be used for an international volleyball tournament in June. Where and when they will be moved remains unclear. 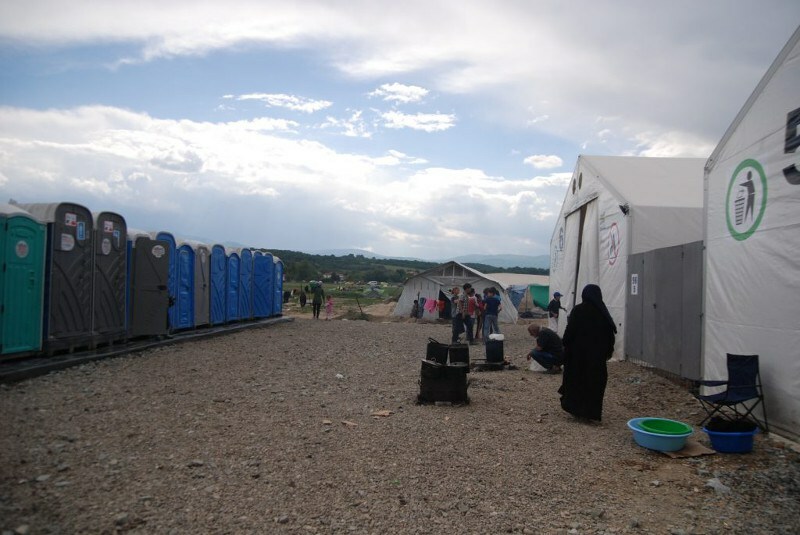 The camp in Doliana is close to the Albanian border in the very northwest of Greece. Around 200 people stay in a former music collage, which is very secluded in the forest. It´s a 10 minutes walk to the tiny village of Doliana with 140 inhabitants. Without registration no visitor is allowed to enter it, but the people can come and go as they want. However, there is no where really to go to. The Greek army from a nearby base is enforcing this procedure. Talking to Kurdish women in front of the main gate made clear once again what the main problem is: They do not have any information about their rights; no information about how to claim asylum; no information about their right of family reunification if they have their husbands, wives or under aged children in Germany. As in most other camps, a lot of people in Doliana qualify for family reunification under the Dublin III accord. People have not yet tried to get an appointment with the asylum service via Skype, as they had no information how the procedure works. Applying for Asylum and family reunification is only possible if one gets an appointment via Skype. The Skype line however, is only open for one hour per week. In other camps we were told that it is nearly impossible to get through. 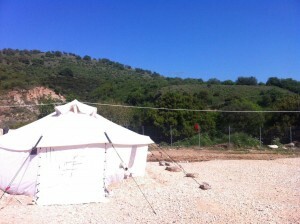 Doliana is exemplary very the very random standards of the Greek camps. 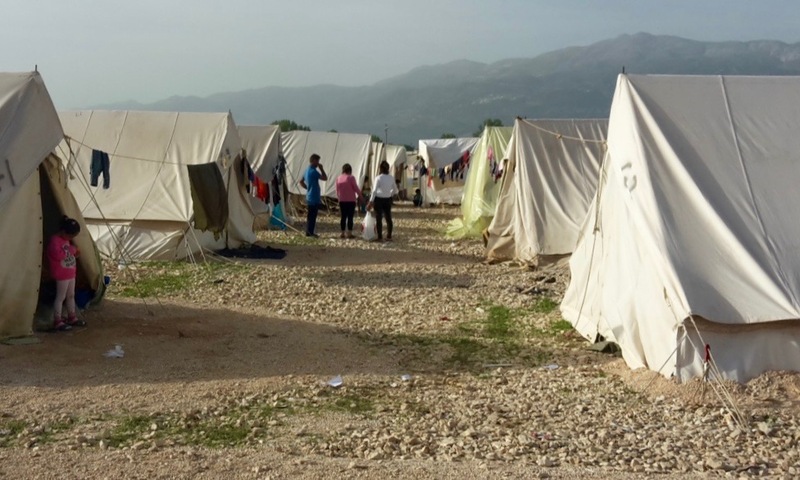 In Katsikas an hour drive away, people have to sleep in tents on the rocky ground, have miserably sanitary installations, no shade, but a lot of snakes. 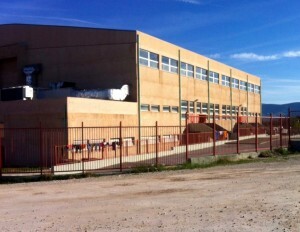 In Doliana people stay in the old boarding school. 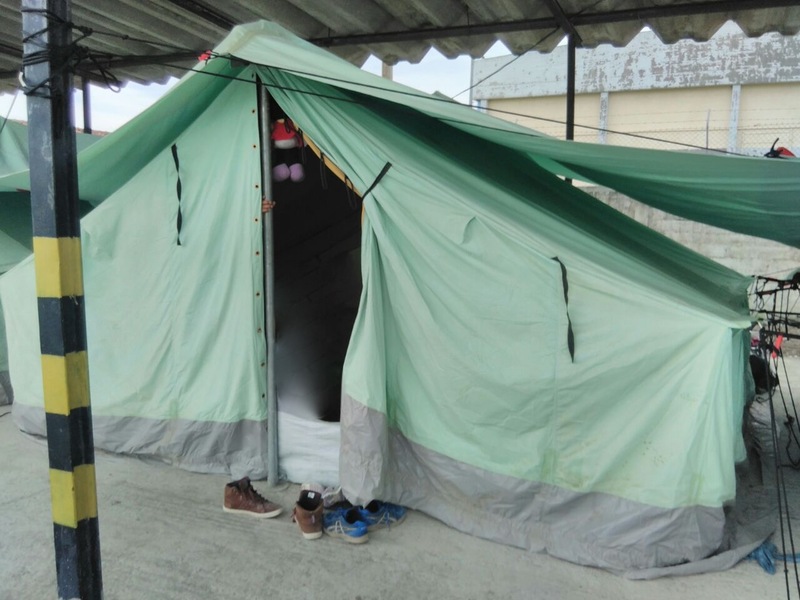 Although 4 families – around 20 people – have to share a room and have no privacy, the living conditions are better than in many other camps in Greece. 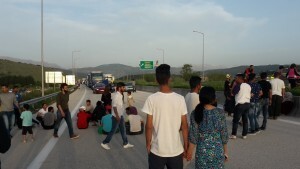 The protestors from the camp in Katsikas spent the night on the highway. The Protest continued this morning, and as more people amassed again on the highway, they marched on to the highway crossing to block all ways. Reportedly, the major came by and told the protestors that they have to leave the highway otherwise they will be removed by force. As the protestors insisted on the fulfilment of their demands for better living conditions and the major’s threat was implemented. Riot police violently pushed people of the highway. The people were noticeably in distress, children where crying and people fled the violent riot police back to the camp. However, 27 people were arrested, among them also Greek and international solidarity protestors. 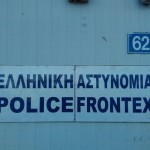 While in the camp in Katsikas the windows of the police containers where smashed, anarchist groups in Ioannina responded quickly to the violent eviction and the detention as well. They occupied the town hall in Ioannina, where the major was therefore stuck. Nobody could enter or leave the townhall anymore. Negotiations went on and around 7pm the detained protesters were all released without charges. Shortly after, the town hall occupants retrieved. Meanwhile, the fear of deportation back to Turkey spread among the protestors in the camp. They were told by police forces, that all people will be deported to Turkey who participate in further protests. Thereby, the authorities tried to ensure that protest will not re-emerge too soon in Katsikas. Similarly, intimidation was practiced in Idomeni today. Military planes and helicopters where circulating over the camp for hours. Apparently, this was to intimidate Macedonia/FYROM who has trespassed repeatedly shot tear gas and shock grenades into Greek territory. However, who was probably more intimidated were the people in Idomeni who have fled war and hoped to seek safety in Europe. 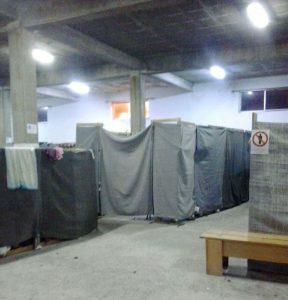 The conditions in the camp in Katsikas are terrible. From our judgement even worse than Idomeni. Around 1’000 people live in tents and have to sleep on the rocky ground. 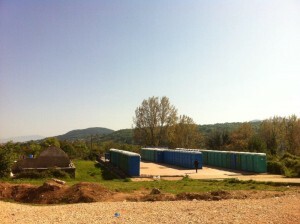 According to the UNHCR they are only 20 toilets and 12 showers in the whole camp. People stated that the food that the army supplies is very bad and access to doctors sometimes not given. If it rains, like on Monday, the camp floods and after the rain snakes and scorpions crawl around the camp. The protest is ongoing since about 6pm. People from the camp keep joining the protest. They are bringing blankets and sleeping bags, preparing to spend the night on the highway. 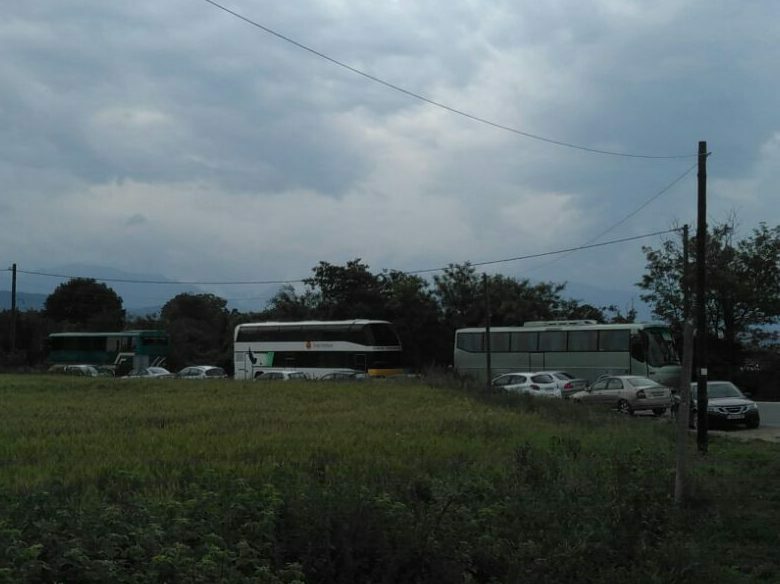 Meanwhile, the authorities feared that the people who refused to leave their buses would join the protest. 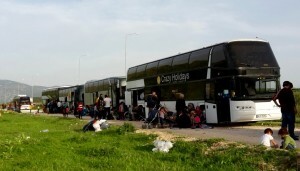 Hastily they told the people in the buses that they will be brought to Thessaloniki now. Their collective refusal to leave the buses ended up successful for now. However, where they really will be brought to remains to be seen. While the protests in Idomeni are continuing and international media is covering the situation there, the people in the other camps, scattered around Greece remain almost invisible. However, as the protest in Katsikas show, people are collectively fighting for their rights across Greece. The Camp is located in the Northwest of Greece, around 4 km outside the town of Filippiada. It is of the main road leading to Ioannina, with lots of traffic. It is situated on a large gravel-covered area. On the other side it faces a dense forest leading towards a river. In order to enter the camp, one has to register with the municipality. The reason given for this procedure: preventing smugglers from entering the camp. There are around 700 people living in the camp, half of which are children. People are sleeping in small tents, which each house around 7 people. In the back there is a paved area with Dixie toilets. 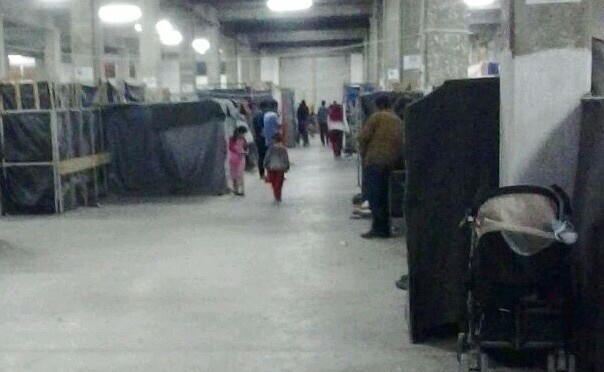 There is a large warehouse on the site where volunteers from the close by town Arta distribute clothes and baby food for some hours during the day. Besides that there is nothing. “There are no organisations here, no journalists, the UNHCR has been here once. Now the Pope goes to the Islands. The media is on the Islands and at the border. 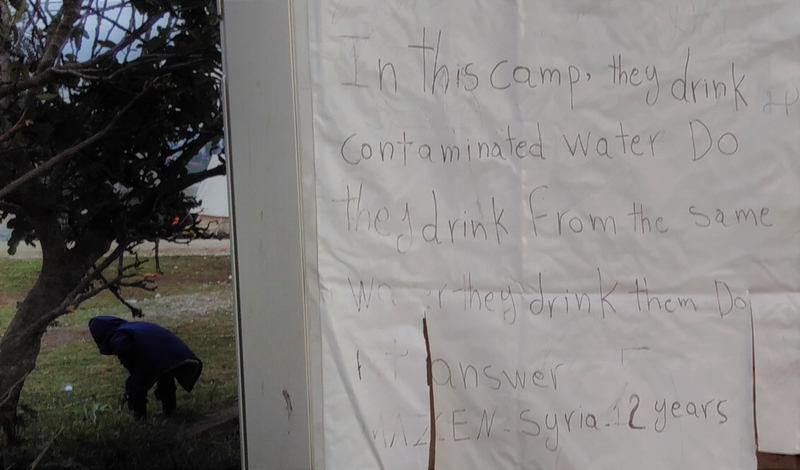 We are forgotten here!” says A. a Syrian refugee who, like most other refugees, has been in the camp for almost a month. who is eight month pregnant and here with two children has her husband waiting for her in Germany. “I don’t want to give birth here. There are only male military doctors here. I need some proper care!” she exclaims. While we were visiting the camp, a group of local lawyers came to “inform the people what their rights are.” As they started explaining in a large circle of people that they can ask for asylum or for the relocation program via Skype, the whole circle started laughing. “We have tried to call via Skype many, many times. None of us ever got through! We know we have the right to apply for asylum, but the system is not working.” one of the refugees explained.